Born and raised in the outskirts of Boston, Francesca graduated from Springfield College with her Doctorate in Physical Therapy in 2016. She spent a full academic year of clinical affiliations working in both outpatient and subacute rehabilitation settings with patients of varying neurologic and orthopedic conditions including athletic and war-related injuries, traumatic brain injuries, and ALS. Growing up, Francesca participated in sports such as soccer, lacrosse, ice hockey, and track. She now enjoys long-distance recreational running. 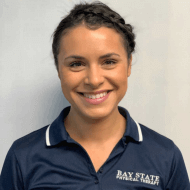 Francesca is a member of the American Physical Therapy Association and is fully committed to restoring each of her patient’s maximum function and helping them to reach their personal goals.